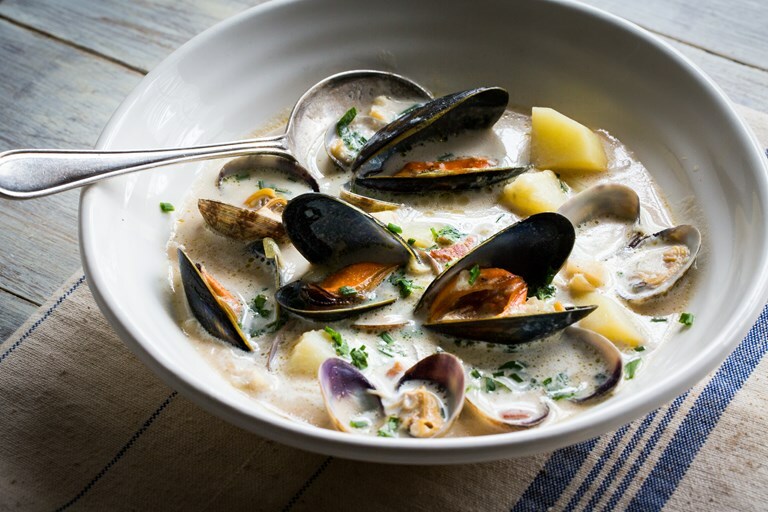 Louise Robinson's smoked haddock and shellfish chowder recipe is a pure celebration of the sea – perfect for the chilly winter months when much of the country's best seafood is in season. To learn how to prepare the mussels for cooking, check out our guide. I rarely plan what to buy when I visit my local fishmonger. My purchases are usually inspired by what looks particularly good on the day. This morning there is a bitter wind blowing in from the sea as I join the queue at John's little wooden shop on the seafront. The boats moored on the pebbled shore behind the hut have already delivered the days catch, his slab is laden with an array of bright, glistening fish. Faced with such bounty, a certain amount of indecision is always inevitable. A bowl of plump king scallops tempt, as do piles of iridescent mussels and clams. John is as patient as ever with my procrastination. The perfect dish springs to mind – a hearty winter chowder. I select a thick fillet of naturally smoked haddock, add a few scallops and a couple of greedy handfuls of the mussels and clams. 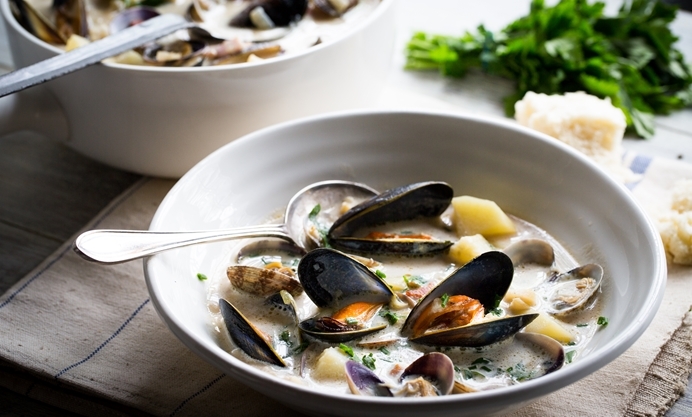 A good chowder should be a celebration of the sea – it does not claim to be a frugal dish. Do not be tempted to skip the generous dash of cream to finish. It should be as luxurious as fine cashmere on a chilly day. The chowder will benefit from the flavour imparted by a good quality fish stock, but otherwise water will suffice. Serve in warm, deep bowls with plenty of fresh crusty bread and butter.